Crouching to get under the lip at Gooch's in mid-October. Autumn has been good for surf, which is a really good thing because the summer was just awful. Hermione produced some really clean head-high to overhead surf at the local break, and Matthew served up some decent sessions as well. I've been out in some of my biggest waves, and I'm mostly able to manage the drop, the turn, and the trim - even in lineups packed with surfers. In between the big storms, we've had plenty of long period, midsize swell that's just great for logging. In late September, I made a commitment to cross step. While it has really compromised the quality and length of many of my rides, I've used the relatively consistent 3- and 4-foot surf as an opportunity to get comfortable moving fore and aft. I still head to the nose too early (or too late), but I'm pretty comfortable cross stepping my way around the board. It's still not pretty; I have a heavy-footed approach that I need to lighten up quite a bit. But I can sense the progress. I see it, feel it, and experience it in the ways I recognize what I need to do on the wave and quickly execute it. 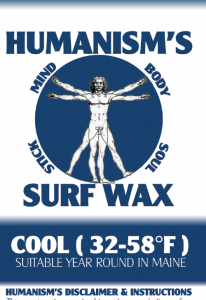 In a moment of wild enthusiasm, I decided to develop a surf wax brand: Humanism's Surf Wax. It's a great wax for New England, and it has a history dating back to the gods and titans. Invented by Hephaestus, god of fire and woodstoves, this wax helped Poseidon surf the ancient seas. Stolen from Olympus by Prometheus, the formula contributed to human flourishing for millenia. Its loss ushered in the Dark Ages. But fortune favors the curious, and Renaissance scholars found the lost formula while translating Homer's third epic, Kymatistá. This wax - now forged in New Hampshire for those strong in spirit, free in thought, and sound in body - may have failed Icarus. But it is perfect for New England. Enjoy! The back story involves a trip to a local surf shop and discovery of the option for surf wax custom branding options out of New Hampshire. I reached out to Jim at Jimbo's Surf Wax to get a case of "private label" Cold Water wax and got busy with a design. Along the way, I got a bit overzealous and ended up designing three distinct private labels (Lil' Crippsy Surf Wax and Ma Em's Noogis Surf Wax are the others) and getting Jimbo to put his special blend in my wrappers. Fun stuff. To put it mildly, I won't be wanting for wax anytime soon! The inspiration for my "legend" is the legend that appears on every carton of Newman's Roadside Virgin Lemonade, a great lemonade that pairs well with brewed tea in the Maine summer.